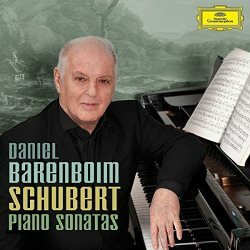 Daniel Barenboim’s collection of Schubert’s Piano Sonatas makes no claim to being complete, as he has elected to record only those works which are considered finished. So no fragments and no D.840 Reliquie: but with full measure of repeats there is no real feeling that we are being short-changed. Barenboim aims for clarity, showing Schubert’s development as a composer with the sonatas part of the intimate ‘musical diary’ which includes the songs and other chamber music. Lack of publication of the majority of these sonatas meant Schubert would have been used to performing them for his circle of friends, no doubt trusting their sympathetic ear for these often remarkable harmonic journeys. It’s a shame we don’t complete this line backwards with the 1815 sonatas D.157 and D.279. There’s plenty of good music to be discovered in the six or so sonatas left out of this still substantial collection. No set of Schubert sonatas can really be labelled definitive in terms of performance, so Barenboim’s decisions can be taken on their own terms without the need to place this set against more complete recordings such as the whopping 14 CD box from Michel Dalberto (see review). “The music laughs and cries at the same time”, says Barenboim at the start of the video trailer for this release, and this great musician’s thoughtfulness and sensitivity are always present in his playing. He doesn’t overwork these sonatas, allowing Schubert to speak, sing and indeed cry out to us in a sometimes disarmingly direct fashion. Collectors of recordings by the likes of Paul Lewis (see reviews here, here and elsewhere) may initially feel a little lost when confronted by Barenboim’s almost self-effacing approach, particularly with some of the earlier sonatas, but these are performances which pay their dividends over time. Barenboim is clear and direct, but he is by no means superficial. If you are just sampling this set or have just opened the box for the first time, I might suggest starting with CD 2 rather than CD 1. This goes against the ‘development over time’ idea when it comes to Schubert’s growth in his sonatas, but you might prefer to have some hooks from which to develop your listening experience rather than launching with the appealing but less ambitious D. 537 and D. 568 and thinking twice about purchasing. The Piano Sonata in B major, D.575 has turbulence and drama from the outset, and you can hear Barenboim’s contrasts of mood – that ‘laughing and crying’ – to full effect. His delicate touch in the gentle Andante second movement is all about that personal intimacy of the ‘musical diary’, the composer almost talking to himself as well as observing and responding to a world both close and distant – the unattainable unleashing fury as well as churchy piousness. The beautiful opening to the Piano Sonata in A major, D.664 sells us Barenboim’s feel for articulating songlike lines as if the words were almost still a tactile presence. With these and many other convincing elements in place we can settle more to an appreciation of these performances, responding to what we hear rather than to what we might be used to. This happens to be one of my favourites, and the way Barenboim caresses the strings of the piano in the opening of the Andante is marvellous. His tempo isn’t slow, but this allows the movement’s shape and dramatic curve a coherence which lingers in the mind like a brief and simple poem which leaves you forever changed. This is a sonata filled with dark moods, but playfulness is also present in the final Allegro, sunlight dappling the shadows and expressing a joy in life which sharpens the edge of all that poignancy. These are descriptions which might also apply to the Piano Sonata in A minor, D.784, and in passing I had a quick comparison with Paul Lewis on HMC 902165-66. His performance is admirable and I always have a hard time picking favourites. Lewis has an urgency in his explosive contrasts which is compelling, but Barenboim’s touch has a richness which suggests more held in reserve. This holds true for the outer movements in equal measure, his lyrical feel in the central Andante again quickening what could be a more funereal tread. He gives correct weight to some remarkable dissonances while creating a shape which eases the feel of air in the middle section – our gaze turning skywards in the most natural way possible. Without going through each sonata and providing blow by blow accounts of how sublimely satisfying everything is I would hope readers can extrapolate that the highlighted qualities of the few also represent the many. I very much enjoy Barenboim’s contrast in, for instance, the opening Moderato of D. 845, in which melting beauty dances cheek by jowl with a sense of fun in the Viennese salons. Then there's the absolute sense of poise and delicate shading of colour in the Molto moderato e cantabile of D. 894. With the superb depth of the recording quality in this set nothing Barenboim places before us is wasted. His highly sustained level of communication is a joy to behold and to hear unfold. The final Piano Sonata in B flat major, D.960 is something of a Holy Grail when it comes to piano music, and my favourite of late has been another Deutsche Grammophon release with Maria João Pires (see review). Barenboim compresses a few transitional corners where Pires relishes secondary moments and lines more, but his sense of the grand occasion and drama in Schubert’s opening Molto moderato enthrals with its sometimes fragmented elements of song and striking dips and darts of range and dynamic. The timelessness in the Andante sostenuto is done with both a molto when it comes to the sostenuto, and an almost surreal softness – a layer of sound underlying the melody which can be as intangible as a cloud. Barenboim teases with the Scherzo, inflecting with little rubati which suit the music perfectly, keeping us guessing without distorting the main message beyond comprehension. He is controlled but capable of taking full flight in the Allegro ma non troppo, an ideal interpretation of the marking, allowing for plenty of detail and restraint as well as passages of real impetus. That said, Barenboim does speed things along in the transition from 3:00 as if a little impatient with Schubert’s musings and repetitions. He keeps everything intensely interesting however, with little touches like the occasional ‘woof’ of a spread chord or moments where time is stretched and toyed with. On those occasions Schubert’s remarkable notes are treated as a living, breathing thing rather than preserved like a precious antique. Barenboim’s Schubert is filled with all of these elements, blending pragmatism with magic to create that music which indeed “laughs and cries at the same time”. Having entirely entered this world you now have permission to go back to CD 1 and see if you agree with the riches to be found along with playing which is so fluid and easy sounding that you could be mistaken for hearing it as a bit of a run-through. Sensitised to those crucial little touches: the moments of song emerging subtly from amidst the pianism, the dabs of added weight given to Schubert’s special dissonances, the softness amidst the drama and the containment which prevents those extremes from dissolving into hysteria … all of these combine to make for performances which have that special something and more. Add that excellent sound quality and an intriguing booklet essay by Detlef Giese and the conclusion is clear. There is no shortage of good recordings of these pieces around these days and I will continue to love Pires, Lewis, Brendel, Uchida and others, but what Barenboim brings to the Schubert stable is very worthwhile indeed, and indeed, more than just a little bit special.